A reader sent me the photo below left with the comment that it captures the present day trivialization of patriotism and the flag. 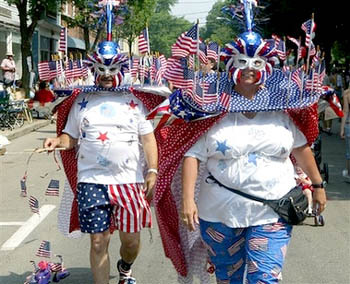 A man and woman wearing childish and outlandish space-age helmets in red, white, and blue march in a local Fourth of July parade. The woman in the foreground wears a most unflattering T-shirt speckled with stars and a pair of trousers decorated with small American flags. On her heels is her compatriot, a “big boy” in a matching T-shirt and pair of shorts made to look like an American flag flying sideways. He marches along playing with his puppet toy decorated with flags. I imagine they are both wearing the typical American tennis shoes, perhaps also colored with the stars and stripes. In a public parade honoring our country, one used to find men and women dressed with dignity, displaying their medals and symbols of honor on their uniforms and proudly carrying the American flag. Coming down the street - entertaining and edifying the onlookers - were the local band in full marching uniforms, representatives of the various Armed Services in parade dress, the Knights of Columbus in their ceremonial hats and caps, and so on. Today, the sense of honor for our flag has almost disappeared. The flag has become a part of the hilarity and fun of the holiday: We see it on shorts, shoes, watches, jewelry, baseball caps, dog costumes, even baby diapers. We have accustomed ourselves to life as a comedy; to entertain modern man everything has to be funny, a grand joke. Therefore, alongside what remains of the ceremonious in our Fourth of July parades, we find the ridiculous, the extravagant, and the unsightly. We have, as in the photo above, grown-ups who appear to never have grown up and, further, to have loss any sense of aesthetics. I had saved another similar picture, below right, snapped at a Los Angeles July 4th parade last year, which I also present for my reader. 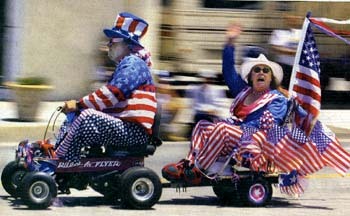 A grown man with a painted white face dressed like a clownish Uncle Sam drives a pint-sized motor scooter. On the cart behind him, he totes a waving woman in a cowboy hat dressed in similar flag fashions. Today it is plain to see that many men and women who should be responsible for maintaining the good sense and equilibrium of the family and society look and act like adolescents. When adults wear clothing disguised as the American flag and behave in this way, how can we expect our youth to act with maturity, dress with decorum, and respect the symbols of our country? One has to ask, where is the sense of honor due this symbol? While our troops fight heroically in Iraq to defend the honor of our nation and the values the United States represents, we laugh and desescrate its banner, the symbol of our History and the good that we stand for. It represents a contradiction, a schizophrenic behavior harmful to American patriotism. This clownish display of our banner should be criticized and banished from our commemorations. It takes liberty a step too far to allow our citizens to insult the nation's symbols, even if is under the pretext of lighthearted jest. Why Should Only Women Dress Well?